(Nanowerk News) There appears to be many potential benefits to patient outcome from using nanotechnology in dentistry. The benefits include new materials for preventative health care using dentifrices that are either antimicrobial and/or have some restorative properties for the enamel and dentine. 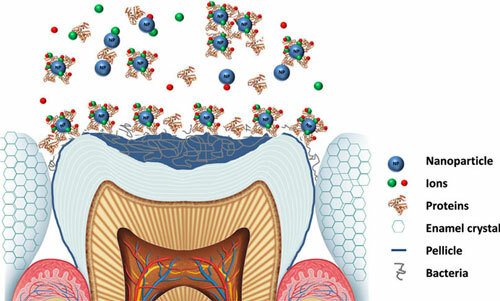 A new review paper in ACS Nano ("Review of Nanomaterials in Dentistry: Interactions with the Oral Microenvironment, Clinical Applications, Hazards, and Benefits") aims to detail the ultrafine structure, chemical composition, and reactivity of dental tissues in the context of interactions with ENMs, including the saliva, pellicle layer, and oral biofilm; then describes the applications of ENMs in dentistry in context with beneficial clinical outcomes versus potential risks. The use of engineered nanomaterials (ENMs) to enhance themechanical and physiological functions of the tooth via new nanofillers and composites should provide an enhanced capability for some areas of restorative dentistry. The use of ENMs to improve osseointegration, infection control, and biocompatibility of dental implants may reduce the rejection rates in some invasive procedures. There are also completely new frontiers in dental treatment such as the use of ENMs to control and direct pulp stem cells in order to regenerate the tooth. These potential benefits should be balanced against the risks. For the patient the exposure to ENMs will be controlled by the planned dental treatment, and thus, the main concern is on the hazard of the ENMs in dental materials. The data so far indicates that oral toxicity for ENMs is low, but some ENMs are translocated across the gut to cause systemic disturbances, perhaps with organ pathology. However, the matrix in which the ENM is incorporated will be important, and oral toxicity studies have yet to be done with dental materials containing EMNs. Overall, however, the information so far indicates that the oral hazard is low or manageable and should not be a barrier to the safe innovation of nanotechnology in dentistry. The safety assessment processes in place for medicines and medical devices remain robust, and although individual toxicity tests may need modifications to work well with ENMs, the overall safety strategy is appropriate. Nonetheless, there are some improvements in health and safety that can be made. For example, better guidance to practitioners on nano-incorporated products with respect to patient safety and occupational health. For the public and patients, the nanospecific labeling on the many personal care products in dentistry could be improved to clearly identify the nanoingredient(s). Thus, giving clarity on whether a product actually contains an ENM and what the proposed mode of action or benefit of the new product might be to the consumer.